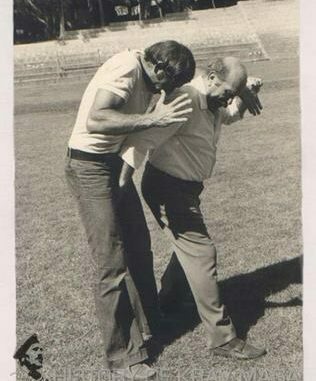 Imrich (“Imi”) Sde-Or*, founder of Krav-Maga, was born in 1910 in Budapest, which at the time was one of the centers of the Austro-Hungarian Empire. He grew up in Bratislava, the capital of Slovakia, in a home where sports, law, and Central European education were equally respected. Samuel Lichtenfeld, Imi’s father, was undoubtedly quite a unique figure. At age 13 he joined a traveling circus, and for the next 20 years engaged in wrestling, weightlifting, and various demonstrations of strength. For him the circus was also a school, where he met people involved in a wide variety of sports, including some quite unusual ones. These people taught Samuel what they knew – including various martial arts. With his father’s encouragement, Imi became active in a wide range of sports. He first excelled in swimming, and subsequently in gymnastics, wrestling, and boxing. In 1928 Imi won the Slovakian Youth Wrestling Championship, and in 1929 the adult champion- ship (in the light and middle weight division). That year he also won the national boxing championship and an international gymnastics championship. During the ensuing decade, Imi’s athletic activities focused mainly on wrestling, both as a contestant and a trainer. In 1944 Imi began training fighters in his areas of expertise: physical fitness, swimming, wrestling, use of the knife, and defenses against knife attacks. During this period, Imi trained several elite units of the Hagana and Palmach (striking force of the Hagana and forerunner of the special units of the IDF), including the Pal-Yam, as well as groups of police officers. In 1948, when the State of Israel was founded and the IDF was formed, Imi became Chief Instructor for Physical Fitness and Krav-Maga at the IDF School of Combat Fitness. He served in the IDF for about 20 years, during which time he developed and refined his unique method for self-defense and hand-to-hand combat. 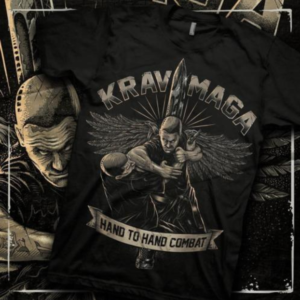 After he finished his active duty, Imi began adapting and modifying Krav-Maga to civilian needs. The method was formulated to suit everyone – man and woman, boy or girl, who might need it to save his or her life or survive an attack while sustaining minimal harm, whatever the background of the attack – criminal, nationalistic, or other. To disseminate his method, Imi established two training centers, one in Tel Aviv and the other in Natanya. Imi continued to personally supervise the training of those who have attained high ranks in Krav-Maga, and to spend time with the instructors in Israel and abroad. Imi monitored the trainees’ progress and achievements, captivating them with his personality and imparting them with his knowledge and unique personality. Imi, a teacher, a fighter and a great human being, passed away on the 9th of January 1998, early in the morning, in the hospital just 5 hours after he got there. His contribution to the world of Martial Arts will forever live in us all, so that one may walk in peace.